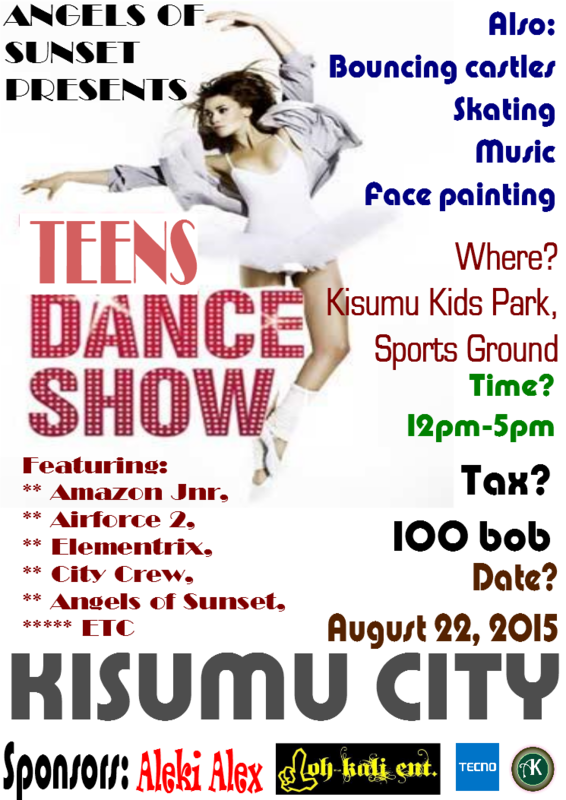 This August holiday, it’s the Kisumu teens entertainment show again. This time, we bring you a Teens Dance Show, to be held on August 22, 2015 at the Children’s Park, Sportsground. If you don’t know where the park is, just pop in to the ground and ask the watchies over there where the park is. In a nutshell, Angels of Sunset wants to celebrate dance as talent among teens, by mobilizing the Kisumu community to join us in raising funds to support the education of young kids in Kisumu Slums. Entrance to the event will be KShs 100.00 only, but one is able to pay as much as he/she can since this is for a worthy cause. Purpose to attend. Bring your kids, let’s have fun! It’s a kids party! among other individual partners & supporters.